As a child, poor Ence was constantly traumatized by aquatic denizens from below. I like the title “sir”, as if it’s a knight. This entry was posted on Wednesday, September 14th, 2011 at 12:00 am and is filed under Comics. You can follow any responses to this entry through the RSS 2.0 feed. Both comments and pings are currently closed. 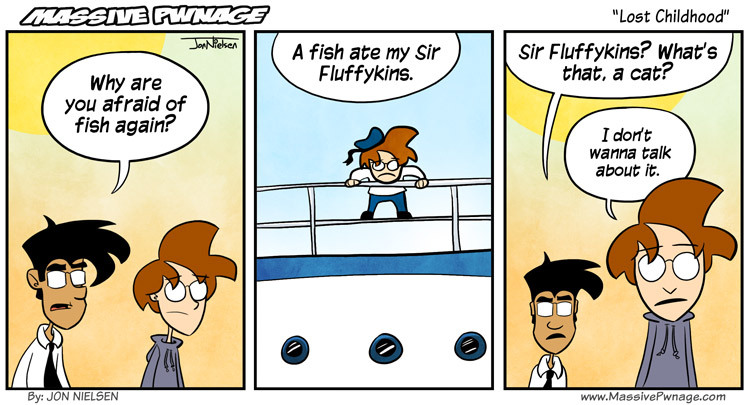 I actually looked back at some comics, and found that Mr. Fluffykins is Ence’s pet rabbit that he grinded wolfoids for. Really? Did I use that name already? Time for a retcon!